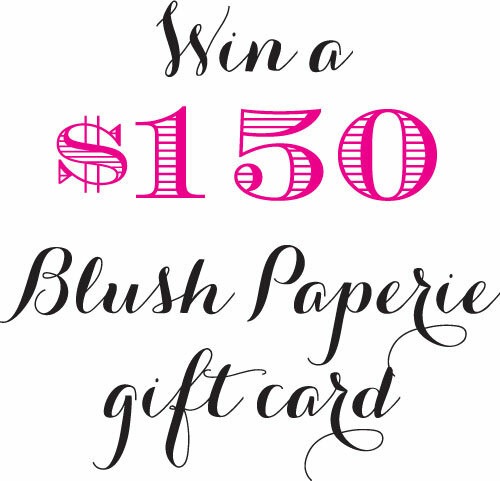 Blush Paperie: $150 Blush Paperie Gift Card Giveaway! $150 Blush Paperie Gift Card Giveaway! We are giving away one $150 gift card! You have three chances to enter this contest! Then come back here and leave a comment for each one you did (do 1, get 1 chance to win, do all, get 3 chances to win). The gift card is good for any Blush Paperie merchandise (thank you cards, wedding invitations, menus, etc.). Just posted to my Facebook! I'm dying for a peach and gold wedding invitation suite! This could help me get all the fancy extras I want! My favorite wedding planning resource so far has been weddingwire.com -- it's been super helpful in planning my wedding from across the country! Easy to get inspiration/ideas and search local vendors. I also love reading reviews from other brides. Favorite Wedding Planning Resource- the knot! Just sent out a Retweet on Twitter too! My favorite wedding planning resource is marthastewartweddings.com. Great etiquette advice, DIY ideas, and photo inspiration! I second the last comment... I love Martha Stewart Weddings I love the website , magazine , etc !!! I also have an amazing binder my MOH got me called the "Ultimate wedding planner and organizer"!! I love my invites!! They are so amazing can't wait to send them out ;) thanks!! My favorite wedding planning resource is Pinterest-not really a traditional wedding planning resource! It has helped me put together ideas of what I would like at my wedding! TheKnot.com has been great for planning a wedding 1500 miles away...but, Pinterest has been my favorite for idea gathering! The site that I've gone to the most during my wedding planning is Theknot.com. I've done a lot of my budgeting there. Great contest! Love your invites! My favorite resource are the countless number of wedding blogs - especially all the DIY ones. Pinterest is my other favorite! I follow you on twitter @mskenyaf & retweeted. i love looking at etsy and engaged & inspired for wedding inspiration! TheKnot.com has been great for organizing and planning, but StyleMePretty.com has been my favorite for inspiration!